These are quite nice golf balls. Very nice spin into the greens. And nice and true putting. The only bad part of these balls, are they tend to be alittle shorter off the tee. But all-in-all a pretty good ball! This is a great golf ball. The DT Spin has nice accuracy, a nice feel off the clubface, and provides exceptional short game performance. It's also very durable, and lasts longer than most balls. However, it is somewhat lacking in distance, which I suppose is the reason for it being ignored by most golfers, but it's shorter distance isn't noticable. So if you're looking for a nice three-piece ball at a decent price, choose this one. harder than the old dt wound. and less spin should have kept the wound balls. Doesn't spin like the Strata Tour Pro, but it's longer and a bit crisper feeling (I often think the Strata, which I've played a lot because of all the free balls they gave away last year, feels a bit too soft). I played the DT Spin in 25-30 mph winds today and can confirm that it's an effective wind ball. Also, it has a nice feel off the putter, rolls true, checks nicely, and is plenty long. On the eighteenth hole, I finally made a decent swing with my driver and out drove my playing partners by 20 yards. As a bonus it's extremely durable; I bounced it off an asphalt cart path and it was still in one piece. Great ball. Every Titleist ball, Strata Tour Pro and Distance, Taylor Made Inergel Pro, Maxfli Tour Patriot and Revolution, etc. Great Ball, nice balance between distance, spin, and feel...not to mention price. 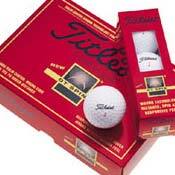 You can save $10 over the top end Titleist balls. You might sacrifice a little distance and playability but great from 150 yards and in. Once downside is that they do seem to mark up easier than most. Great ball, excellent spin, excellent distance, excellent control. Titleist balls are the best!! I didn''t find these balls to spin well for me. I didn''t really see any difference in distance from tee to fairway also.